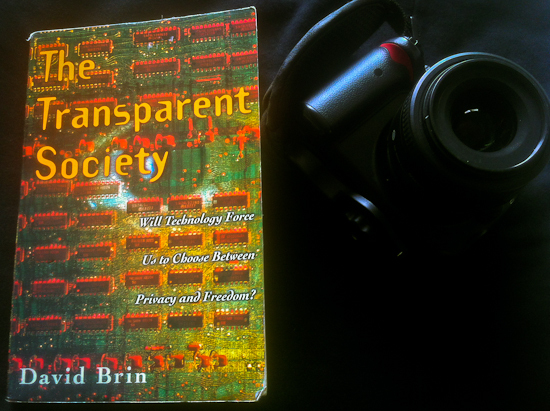 This is just an off-the-cuff post as I do some weekend reading, namely David Brin’s The Transparent Society (1998). I’m curious about the common grand narrative that society has become more transparent and thus will continue to be more so, ultimately creating the state of full transparency, full surveillance, where everything is seen, recorded, and known. I’ve critiqued this line of thought before, as the issue is common in writing about surveillance or privacy, from silly op-eds to pieces by serious scholars like Zygmunt Bauman. Brin begins his book by asking the reader to look 10-20 years in the future, which from 1998 means today. Brin claims in the world of the future-for-him / now-for-us there will be no street crime because surveillance cameras peer down from “every lamppost, every rooftop and street sign” which are “observing everything in open view” (4). To be fair, Brin thought that while public areas had full surveillance, the home would remain largely hidden. His vision was of cameras everywhere in public so that, for example, any individual could call up the cameras to locate their friends. Want to know if your date has arrived at the bar? Just log onto the camera in the bar and look. He gets this wrong in two ways. First, Brin thought of a world where you “pulled” information about what one is doing, whereas, 15 years later, this information is “pushed” at us. Yes, cameras do capture some of what we are doing, but when it comes to public transparency today, we often tell others what we are doing. It is understandable that Brin didn’t see this coming 15 years ago; he lived in a world where the concern was of being watched with the fear of others seeing us. Now many fear not being seen; the concern now isn’t if people know what I’m doing, but the worry that no one cares. As Bauman states in Liquid Surveillance, “the fear of disclosure has been stifled by the joy of being noticed” (23). While Brin’s transparent society is achieved through cameras passively recording, today, many actively announce. Brin understood “microcameras overhead” that see rather than devices in our hands that speak. Second, Brin made too strong a distinction between “private” and “public”, again, understandable given how much those concepts have eroded since. What is happening in the streets, according to Brin, would be transparent, and what happened in the home would be hidden. Today, not only are the streets not fully transparent, what happens inside many homes is much more visible. Homes have become increasingly a domain of surveillance, a type willingly entered into, for example, in the proliferation of our homes, families, food, etc in photos on Facebook. All of this speaks to the general problem of constructing “grand narratives”, once popular in social theory but these days looked upon with skepticism. Making sweeping claims about how society will change in the future is troublesome because it is downright arrogant; one thinker cannot think for all people in all places and all times, rather, there are infinite standpoints and contingencies that should temper the scope of any one theory. I think of Max Weber, who cautioned against grand narratives on one hand but on the other provided some of his own. Take, for example, his theory that efficiency, the centerpiece of what Weber called “formal rationality”, would come to dominate over anything thought to be inefficient. Western modernity, according to Weber, wipes out anything left to chance, anything unknown, mysterious, or hidden. This efficiency would come to dominate and engulf society in a cold iron cage of rationality –a grand narrative to be sure. It didn’t come to pass. Yes, George Ritzer has shown how many sectors of society have been formally rationalized since the time of Weber, for which Ritzer uses McDonalds as the paradigmatic case (McDonaldization also updates Weber’s theory from the bureaucracy into globalized consumer spaces). However, even George Ritzer acknowledges that McDonaldized consumer spaces are not an “iron cage”, but rather what he calls “velvet cages”, making reference to the softer, intentionally-entered-into, forms of rationalized control; Weber’s hell is replaced with Ritzer’s purgatory. We never turned into the Brazil-like iron cage Weber thought was inevitable. Grand narratives often make the mistake of assuming the trends of the present will continue to march on unchecked. Nathan is on Twitter [@nathanjurgenson] and Tumblr [nathanjurgenson.com]. When you say "Street crime still exists as well as street signs without cameras," I presume you are speaking about the US and not, say, the UK? Though the US is probably ahead in drones. Russia has also seen the spread of cameras--google dash+cam+meteorite. Brin just underestimated the time it would take.